January 9, 2018 by iCepts Technology Group, Inc.
Microsoft’s continued commitment and development of Enterprise Resource Planning Systems (ERP) has resulted in the release of Microsoft Dynamics NAV 2018. Dynamics NAV is a robust business solution from Microsoft that continues to be enhanced which is quick to implement, easy to use and has the power to support your business ambitions. 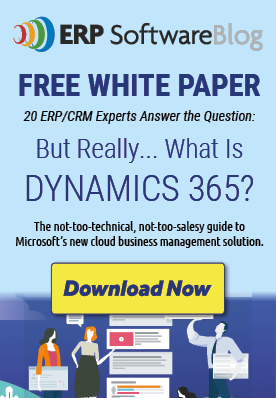 Dynamics NAV is a scalable solution that can be deployed on-premise or in the cloud. NAV customers can access their solution through “Role Based” interfaces on their desktop, in a browser, with a native mobile app on a tablet or mobile device. With technology such as ADCS and Warehousing Management in Dynamics NAV, you can effectively management the movement of inventory and more efficiently control your supply chain. The Automated Data Capture System (ADCS) solution provides a way for Microsoft Dynamics NAV to communicate with handheld devices through web services. With ADSC, through the use of handheld devices, you can capture data automatically and keep data accurate, even in a hectic environment. ADCS supports some of the workflows in the Warehouse Management Systems that enables warehouse automation. Unique to Microsoft Dynamics NAV are Web Services functionality which is a technology that other services, with proper authentication, can easily connect to NAV. These integrations can be wide away of web pages and codeunits including handheld device connections that expand the functionality of the ERP system. With Warehouse Management Systems functionality in NAV, your company can manage items on a bin level. Receive and put away items in a bin; pick items from a bin according to a put-away template; and pick items based on the zone and bin ranking. Move items between bins using a report for optimizing the space usage and the picking process, or move items manually. Warehouse instruction documents are created for the pick and put-away process, which can be carried out for sales, purchases, transfers, returns, and production orders. Service orders are not included. Even with NAV’s rich Warehouse Management features, sometimes Wholesale Distributors and companies that handle large quantities of inventory and have complex supply chains, required even more functionality . That is where Warehouse Management Systems, or WMS, find their niche. With WMS system, such as HighJump Warehouse Edge (formerly AccellosOne WMS), which integrate seamlessly to ERP solutions such as Microsoft Dynamics NAV, along with many others, can help organization achieve an end-to-end streamlined supply chain solution.